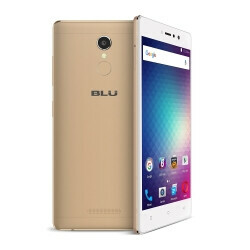 United States-based smartphone brand BLU Mobile has a new smartphone in its mid-range line-up to offer. It's the $199 BLU VIVO 5R, a second half of the year refresh of the VIVO 5, which the company debuted in early 2016. On paper, the handset has a lot to offer for the asking price, but Sprint and Verizon customers must mind that the VIVO 5R is not compatible with these carriers' networks. Still, the 8.1mm-thick smartphone is made of metal and runs Android 6.0 Marshmallow. It's equipped with a 5.5-inch 1080p resolution screen and features a fingerprint scanner on the back panel. The chipset that makes it happen is the MediaTek 6753, featuring an octa-core processor, 3GB of RAM, 32GB of expandable storage, and cellular compatibility with nationwide GSM networks, including AT&T, T-Mobile, Cricket, MetroPCS, Straight Talk, Pure Talk USA, and others. Moreover, the handset carries a 13MP Sony IMX258 camera (same as on the Sony Xperia XA smartphone, for example) with phase detection autofocus. There's also an 8MP wide-angle selfie camera that should be properly optimized for group shots. The VIVO 5R is powered by a 3150mAh battery and comes with DTS Surround Sound technology. It will be sold in Gray and Gold finishes. The BLU VIVO 5R seems considerably advanced for a $199 handset and will probably generate interest in budget-minded buyers. Beside the Moto G4 and some older flagship smartphones from the likes of Sony, LG, and HTC, it's pretty hard to find a $199 smartphone that's recent, runs Android 6.0, and features rather compelling design and specs for the price. The VIVO 5R is up for pre-order from Amazon and Best Buy and is scheduled to ship September 21.
kind of a weak processor for the money. but otherwise, pretty good specs for the price. i'm very happy with my BLU R1 HD. and props to BLU for at least getting rid of that very obvious "BLU" on the front bottom bezel of the phone. And....you are lucky if this device last more than four months. They break easily and unreliable. Batteries usually crap out at the 4-5 month mark too. I'll never buy another BLU product again.